This replacement travel bag for the Hopup tension fabric display has carry handles and integrated wheels for easy transport. This bag is designed to hold the Hopup tension fabric display, so if you're using it to hold something else, you will have to assume responsibility for it working for your purposes. According to the manufacturer, the exterior dimensions of the largest size is 33” x 14.25” x 11.25”. Since it's not a rigid case, determining the interior dimensions is a little difficult, but with a bag, it's pretty close to the exterior dimensions. To be safe, I would assume the interior size is 1/2" less than the exterior. That's probably overkill, but should give you a safe usable dimension. This replacement travel bag for the Hopup tension fabric display has carry handles and integrated wheels for easy transport. 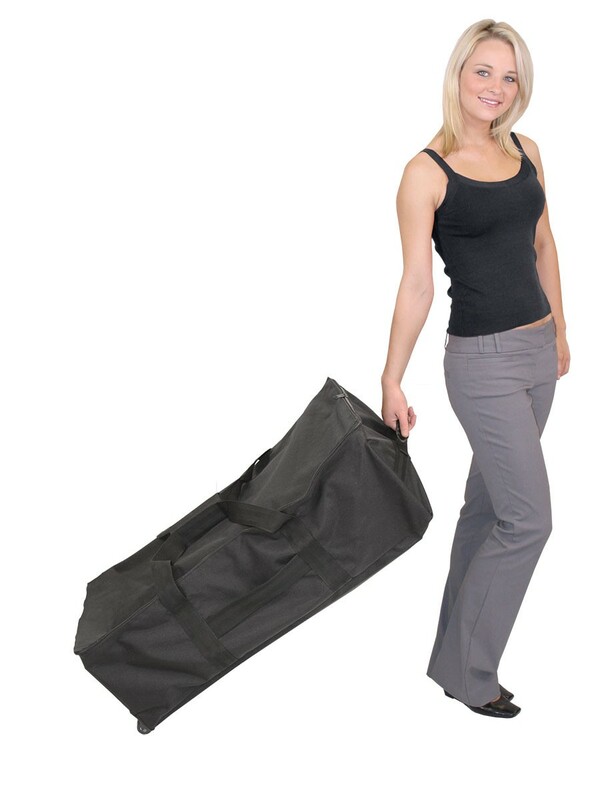 The bag comes in 3 sizes to fit the different sizes of Hopup displays. The smallest size is 33" x 8.5" x 8.5" to hold a 2x2 Hopup or smaller. The medium size measures 33" x 11.25" x 11.25" and holds the 3x3 Hopup, and large size measures 33” x 14.25” x 11.25” and holds the 8x3, 5x3, 4x4 and 4x3 Hopup.